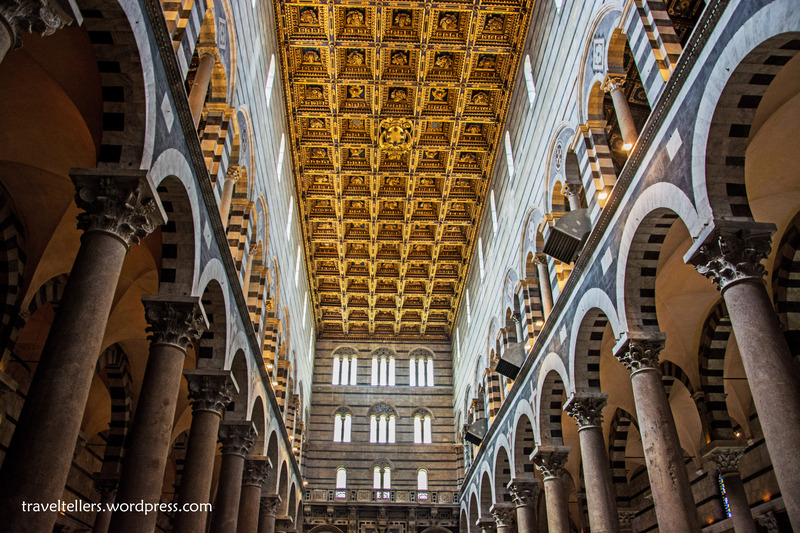 After reading our last blog, you must have realized that we had truly, madly, deeply fallen in love with Florence. 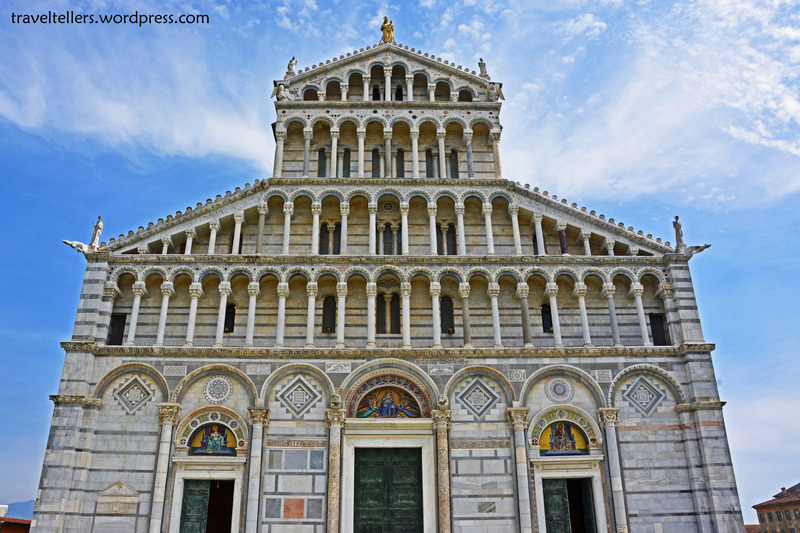 As per our itinerary we were supposed to spend two days in Florence and then visit Pisa on the third day. But by the end of day 2 there was still so much left to see in Florence that we were uncertain about the Pisa trip. But after some deliberations we decided that after coming so close we cannot afford to miss a wonder of the world. Next morning, a 1 hour train journey from Florence S.M.N. Station got us to Pisa Centrale. 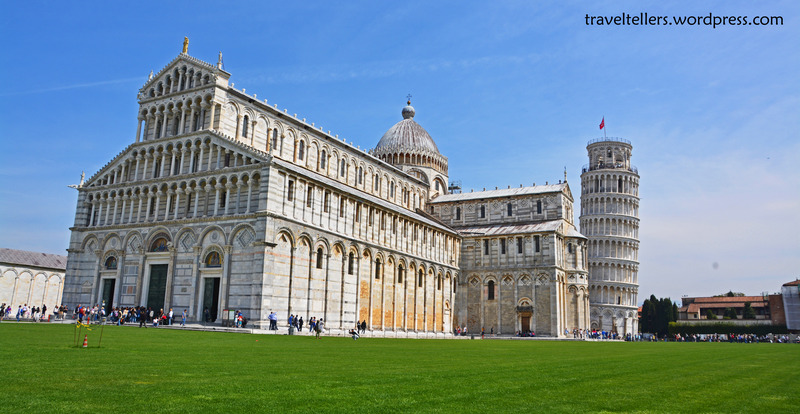 From there we took a bus to Piazza dei Miracoli (the complex in which the Leaning Tower is located), which is around 2 kms from the station. Now I don’t know why but I always thought of Leaning tower of Pisa as an isolated structure. 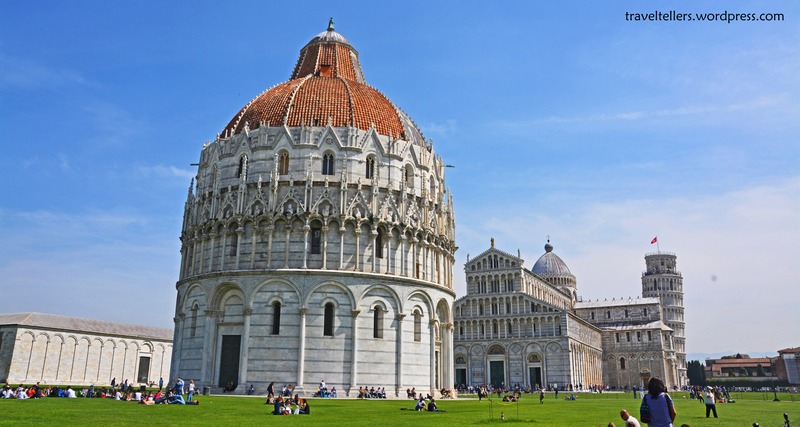 So it was a surprise to me when I saw that the Piazza dei Miracoli has so much more to offer than just the world famous leaning Tower. 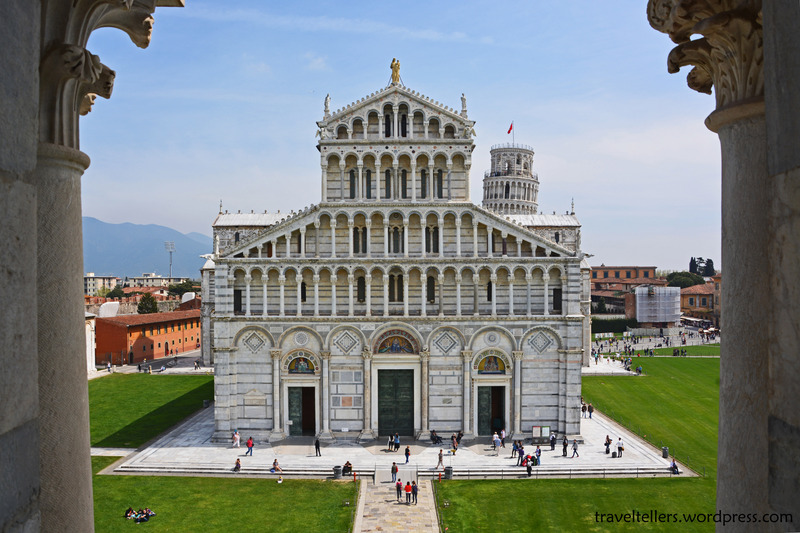 In front of us was a remarkable assemblage of four enormous marble buildings – the Pisa Baptistery followed by the magnificent Duomo di Pisa (cathedral), the Camposanto (cemetery) on the left and the Leaning Tower just behind the church to the right. With its carpet like green turf and perfectly white buildings, the Field of Miracles looked like a picturesque postcard. We visited all the monuments one by one starting with the baptistery since it was the closest. The Cathedral had a distinctive architecture which made it quite different from all the churches we had visited till then. The front facade was a beautiful structure with its tall bronze doors, lean columns and Moorish arches. Like many European cathedrals, this one too had a gilded ceiling and some admirable frescoes. 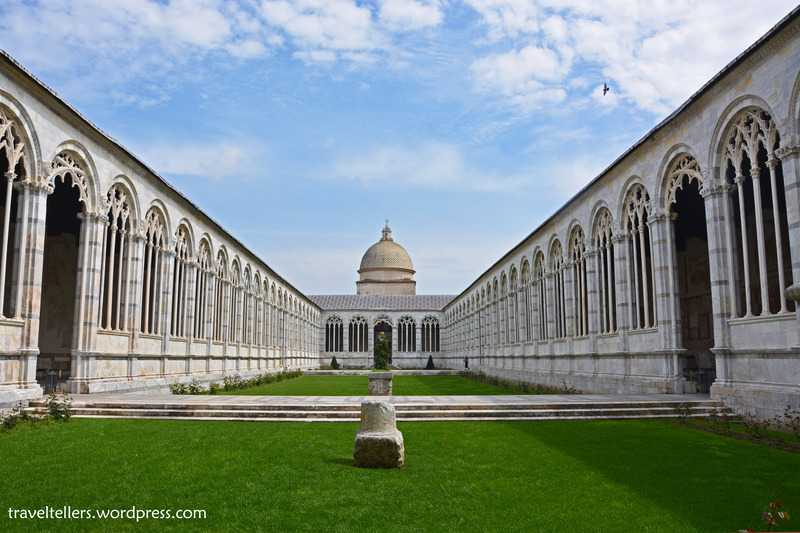 We then visited the Camposanto, which was totally deserted with the exception of the ticket checker. The cemetery was an elongated gothic cloister enclosing a burial ground and had a dome at one end. One of the rooms contained restored frescoes which were partially destroyed in a fire during World War II. 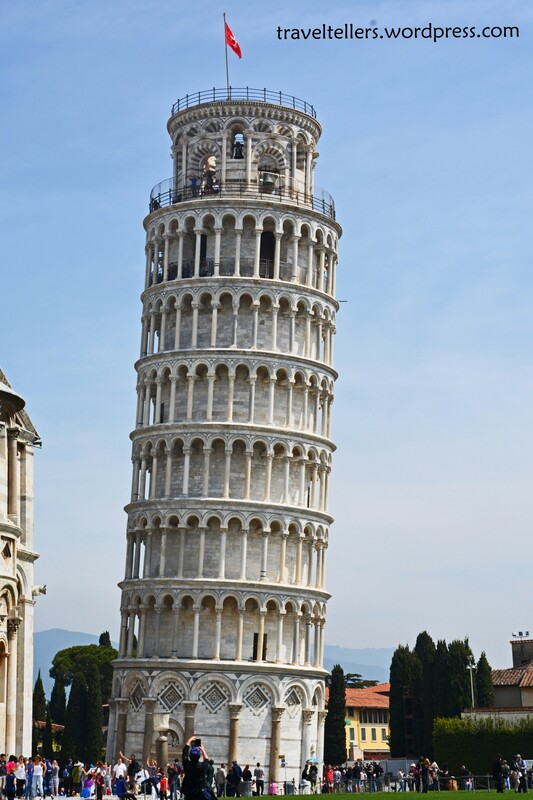 Our last stop was the legendary leaning Tower. It is only when you stand in front of it and observe the base of the tower that you comprehend what an astounding wonder it actually is! Initially the tower leaned at an angle of 5.5 deg but after the restoration work which took 10 years it leans at an angle of 3.99 deg now. You are allowed to climb the tower but we were in a hurry to get back to Florence so we passed up on it. As we walked past the tower we saw hundreds of tourists in weird positions trying to take those really cheesy pictures in front of the tower. Then we thought, what the heck, let’s push the tower upright! Never knew that you had such a deep knowledge of all these places. Was it acquired by research before your trip or did you always have the interest in architecture?